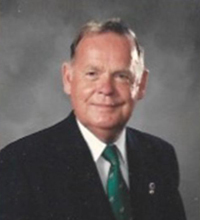 A service celebrating the life of Mr. Edward [Teddy] Somers Chapman, J.P., of Devonshire, beloved husband of the late Nancy Chapman, in his 90th year, will be held at Christ Anglican Church, Middle Road, Devonshire Monday evening, August 13, 2018 at 6:00 p.m. Interment will follow in the church yard at Christ Church. There will be no viewing. In lieu of flowers donations may be made to Age Concern, P.O. Box HM 2397, Hamilton HM JX. He is survived by his sister Doreen Paterson, her husband Don, their daughter Lynne Folds and their son Paul, in England; by his sister-in-law Elizabeth Downing, and her daughters Jane Downing and Margaret Downing-Dill [Sean]; brother-in-law Robert Jack, his son Graham Jack [Susan], and Robert’s daughter-in-law Carol and family; nieces Susan Brown [Mike] and Janet Godding [Steve] and their families; close friends the White family, Anita, Kim, Lee, Jonelle and their families; and many other relatives and friends both in Bermuda and overseas.